The ways in which we produced and consumed food in the last fifty years had devastating impacts on ecosystems and human societies. The agro-industrial sector in fact contributed exceeding 4 of the 9 thresholds that determine the planetary limits — climate change, loss of biodiversity, alterations to the nitrogen and phosphorus cycle, changes in land use. The consumption of unhealthy food is causing very serious health problems, and while almost a billion people do not have food, we throw away quantities of food that would be enough to feed them without problems. It’s clear that the current system, based on a strictly linear logic, does not work, and that the transition to a circular economy would bring enormous benefits to the environment and to consumers. A logic that can be partially attributed to the knowledge and traditions of rural culture, in which everything was reused, and which could encourage awareness of the dynamics and cultural relations underlying the act of eating, encouraging the food system to identify a new balance. 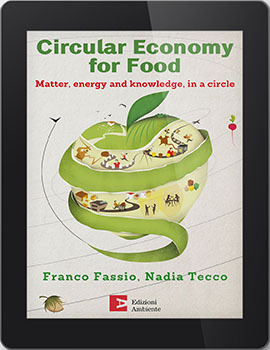 Circular Economy for Food takes stock of the ongoing transformation, and in addition to the contributions of some of the most prestigious italian experts, presents 40 case studies dedicated to companies in the food sector that focused on circularity to pave the way for innovations able to reduce waste and improve the eco-effectiveness and efficiency of products, services and processes in the food system. What is the focus, the product or the people?